File picture of Hardik Patel. Ahmedabad: The quota stir by the Patel community has led to the emergence of new leaders on the political scene of Gujarat, posing a threat to the established leadership of the ruling BJP and main opposition Congress. 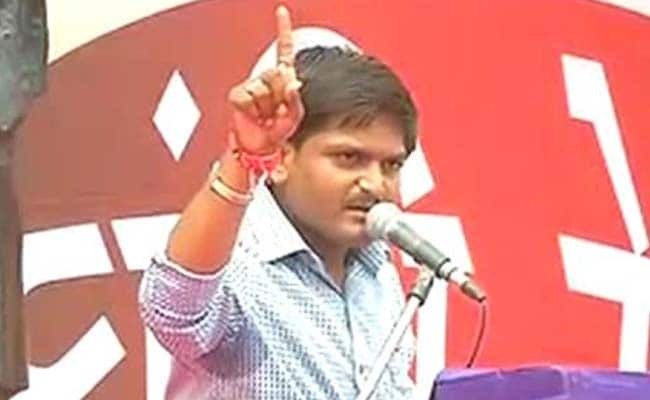 In the last three months, the Patel reservation stir has brought to fore leaders like 22-year-old Hardik Patel, who is spearheading the agitation for OBC quota of his community, OBC youth leader Alpesh Thakor and also Sardar Patel Group (SPG) leader Lalji Patel, who had originally started the Patel quota movement about a year back. They have challenged the established leadership and have made a significant impact on the political equations of last 25 years. The Patels, one of the largest communities in the state which had been an ardent supporter of the BJP, now on the call of their leaders Hardik and Lalji, are disrupting the party and government functions. The Patel-dominant villages have banned the entry of politicians in their societies and their leaders are pressing the community members to use NOTA (none of the above) option while voting in the forthcoming civic polls. "It will be difficult for the BJP in the upcoming civic polls," Hardik Patel has cautioned, while adding that he has asked his community members to use the NOTA option. Alpesh Thakor, the 38-year-old convener of 'OBC Ekta Manch', has been uniting the Other Backward class communities against Patels' quota demand by organising public meetings in different parts of state. The 'OBC Ekta Manch' is an umbrella body of the 146 communities in Gujarat that was formed after Patels raised the demand for inclusion in the OBC fold. Mr Thakor has also warned that if the demand of Patel community is met, they will throw the BJP government out of power even before the 2017 polls. "Patels are just 1.5 crores, while the OBC population in the state is 3.5 crores. If they will give reservation from our share to Patels then we will not allow this government to complete it's turn," Mr Thakor told PTI. Another Patel leader who has gained prominence is SPG head Lalji Patel, who after disassociating himself from Patidar Anamat Andolan Samiti last month owing to differences, recently joined hands with PAAS head Hardik. Lalji (in his 40s) has asked his community people in the US to demonstrate against Prime Minister Narendra Modi during his upcoming visit there. He also called for "economic non-cooperation," after which Patels recently started withdrawing money from banks. The Congress and the BJP, the two main political parties in the state, are seemingly clueless on how to deal with this fast-paced emergence of young leaders on Gujarat's political horizon. Although initially the state government indicated that it was against the demand of reservation by the Patels citing Constitutional provisions and Supreme Court judgement, yet later as the quota stir intensified it held discussions with the agitating community. However, the first round of discussions failed after which Chief Minister Anandiben Patel hit out at Hardik for taking the state towards class conflict and warned that law will take its own course if they resort to violence. However, the BJP leaders are reluctant to go for any public function due to the fear of Patel community protest. The party's 'Vijay Vishwas' public meetings ahead of the local body polls were postponed apparently due to this reason. On the other hand, the main opposition Congress, which had earlier condemned the alleged police atrocities against the agitating Patel community members, has not made its stand clear as to whether it is for or against the Patel quota reservation. The party fears that if it supports it, the OBCs will get angry and if it goes against the Patels, who seem to be alienated from the BJP now, might not turn to them. "We are not the ruling party, we will spell our stand on the agitation for reservation at an appropriate time," Congress leader Shankarsinh Vaghela said.